Laird Guttersen was born on Independence Day, July 4, 1925, in White Bear Lake, Minnesota. He enlisted in the U.S. Army Reserve on June 30, 1943, and entered the Aviation Cadet Program of the U.S. Army Air Forces on August 2, 1943. Guttersen was appointed a Flight Officer and awarded his pilot wings at Turner Field, Georgia, on April 15, 1945, and then served as a B-25 Mitchell pilot in the U.S. until leaving active duty on March 17, 1946. He served in the Air Force Reserve from March 18, 1946, to March 25, 1951, and was commissioned a 2d Lt during this time, on January 3, 1947. After completing combat crew training, Lt Guttersen served as an F-51 Mustang and F-86 Sabre pilot with the 18th Fighter-Bomber Wing in Korea from April 1952 to April 1953, and during this time he was credited with destroying a large freighter near Chinnampo, North Korea, on September 4, 1952. After returning to the U.S., Capt Guttersen completed instructor pilot training and then served as an instructor pilot from July 1953 to February 1956. He then completed fighter interceptor training and Squadron Officer School before serving as an academic instructor at Maxwell AFB, Alabama, during which time he helped develop the manual on teaching the Code of Conduct. Maj Guttersen completed weapons controller training in November 1960, and then served as an intercept control officer until December 1964, followed by service as a C-130 Hercules pilot with the 346th Troop Carrier Squadron at Dyess AFB, Texas, from December 1964 to February 1967. During this time he deployed to Southeast Asia in 1965 and 1966. He next completed F-4 Phantom II Combat Crew Training in August 1967, and then deployed to Southeast Asia again, this time serving with the 497th Tactical Fighter Squadron at Ubon Royal Thai AFB, Thailand, from October 1967 until he was forced to eject over North Vietnam and was taken as a Prisoner of War on February 23, 1968. After spending 1,847 days in captivity, Col Guttersen was released during Operation Homecoming on March 14, 1973. 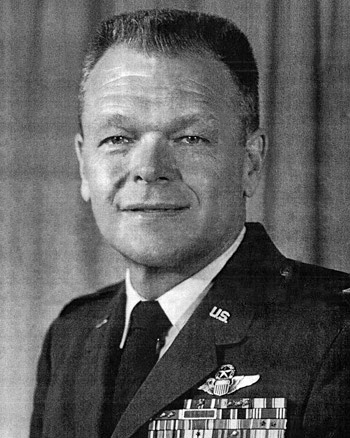 He was briefly hospitalized to recover from his injuries at March AFB, California, and Davis-Monthan AFB, Arizona, before receiving an Air Force Institute of Technology assignment in the Education With Industry Program at EPIC Diversified Systems Corporation in Tucson, Arizona, from November 1973 until his retirement from the Air Force on September 1, 1974. Laird Guttersen died on June 13, 2006. 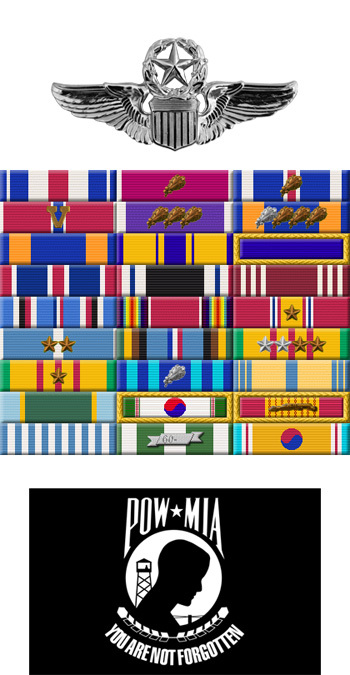 For the Period February 1968: This officer distinguished himself by gallantry and intrepidity in action in connection with military operations against an opposing armed force during the above period while a Prisoner of War in North Vietnam. Ignoring international agreements on treatment of prisoners of war, the enemy resorted to mental and physical cruelties to obtain information, confessions, and propaganda materials. This individual resisted their demands by calling upon his deepest inner strengths in a manner which reflected his devotion to duty and great credit upon himself and the United States Air Force.